Once I start driving home, I try not to think about it until I go to work the next day. This can be harder if you are working on something that's stressing you out, but I usually turn to Netflix, a playlist or a book to get a little relaxed before I start working on my blog. For me, I am better at keeping up with my tasks if I have everything planned out in multiple platforms. The 4 I'm using right now are a Printable planner designed by me, iCloud Reminders, the Erin Condren planner, and Google Calendar. I mainly use this to write down all the posts that I'm writing for the month including guest posts. I also write down tasks on a notepad because there is nothing more satisfying than crossing something off a list. I have on occasion, added a task that I already completed just to make me feel better. Is that crazy? Everything that I am planning for my blog will get a new list so that I can break each one down into smaller tasks. This was super helpful when I was working on my newsletter launch. There were so many things that needed to get done and separating them out made it a lot less stressful for me. Some of my favorite lists are blog layout, blog content, and general blog stuff. Whenever I have downtime and want to work on my blog, I look at each of these lists and pick something to work on. I've also been using Reminders for my job search and setting deadlines for applications and anything else that needs to be done. The main reason I use Reminders is because the notifications pop-up on my computer. When I hit snooze, it will pop-up again 15 minutes later. It's basically someone bugging me about why I haven't gotten a task done yet. I've only been using my planner for a few weeks now and I decided to get one after seeing how everyone was using stickers with them. I don't get as crazy as they do, but adding a creative element helps me keep up with any tasks that need to get done. I've been making my owns stickers, which helps with trying to figure out what works best for me. One of my favorite features is my main goals for the week. I pick three to five things that I want to get done and put them all in the sidebar. At the top of each day, I add a to-do list with the things I need to get done before the end of each day. In the next section, I put an important task that needs to be done on my blog for that day. It might not be the only thing I want to get done for the day, but if anything comes up and I can only get one thing done that day. I just recently started using this and it is really unorganized and I'll be sorting them out into separate calendars this week. I also use it to add silly things I don't want to forget like buying oil for my car after work. The calendars I plan on adding are webinars, Twitter chats and design clients. 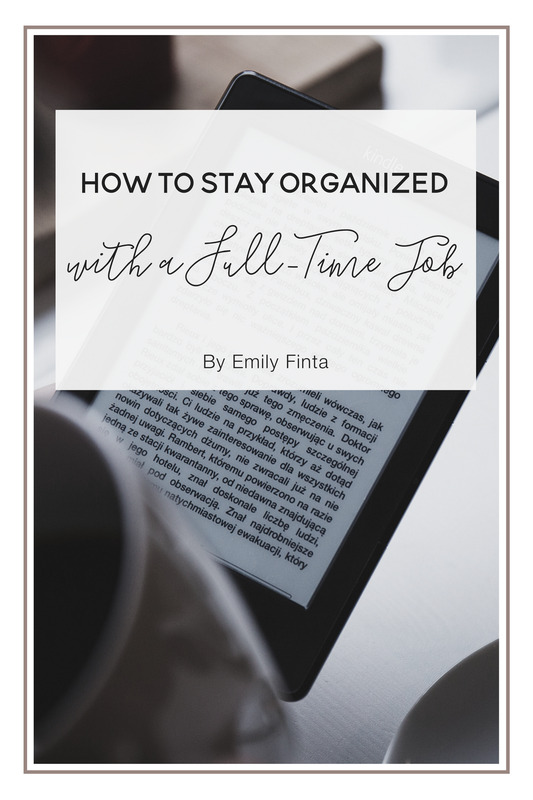 I've tried quite a few different way to stay organized and there are so many that didn't work out for me. I love Asana and we use it at work, but it was hard for me to keep up with and it made it harder for me to separate work & blogging when I was using the same tool for both. I've recently started searching for different tools to invest in to make working with design clients a lot easier. For a while, I had been looking at multiple tools that could only do one thing for me. I was listening to Jenny Purr's podcast, Make It Happen, and one of her guests mentioned 17hats. I didn't even realize there were tools that did everything I needed. I tested out 17hats and decided to try out different platforms because while I loved it, the contracts and questionnaires weren't up to my design standards. I'm currently trying out Motiv and I think it's the platform I'll end up using. It does everything that 17 hats does except for the workflow feature, which I can develop in Evernote or another tool I already use. I’ve recently been working on specific things on a certain day every week. Sundays get spent writing my posts, which takes up most of my time when I’m not working with a client. I’m still working on designating other tasks to my days, but I do schedule all social media on Mondays since my first blog post for the week doesn’t go up until Tuesday. I’m currently talking to someone about being my VA, and trading for one of my design packages. I’m not going to keep finding someone new to trade services with once my time gets done, but while I’m saving up money to move out, it’s a good option for me. If we end up working really well together, then I will definitely continue working with her. There are certain things that I’m not very fond of doing and that I usually end up putting off, so I figured why not try and get a little help on those tasks so I can focus on the things I love about blogging. Do you have a full-time job? How have you stayed organized? Let us know in the comments below! I'm Emily, a graphic designer from Michigan that helps bloggers that are trying to transition from hobbyist to business by making their brand match their new mindset.